A new dispenser for a modified Ariane 5 rocket, capable of carrier four satellites into middle Earth orbit, has passed an extended test campaign and approved for launch, removing a final hurdle for accelerating development of the Galileo constellation. In development since 2012, the new launcher design evolved from the Ariane 5 ES (Evolution Storable) that is used to carry European Space Agency (ESA) automatic transfer vehicle (ATV) supply spacecraft into low Earth orbit. The dispenser underwent comprehensive testing at Airbus Defense and Space near Bordeaux, France, and the Industrieanlagen-Betriebsgessellschaft MBH (IABG) testing center in Ottobrunn, Germany — using both Galileo engineering models and an actual flight satellite. Tests included fit, shock, and separation. The dispenser is now at the European spaceport in French Guiana, ready for installation on Galileo’s first Ariane 5 launcher scheduled to take off this fall.. This launcher has to carry a lower mass payload — four fully fuelled 738-kilogram Galileo satellites plus their supporting dispenser, about three tons in all compared to the 20-ton-plus ATV — but needs to take its payload up to the much higher altitude of medium-Earth orbit, at approximately 23,222 kilometers. The target orbit is actually 300 kilometers below the Galileo constellation’s final working altitude: this leaves the Ariane 5’s upper storable propellant stage (EPS) in a stable “graveyard orbit,” while the quartet of Galileo’s spacecraft maneuver up to their final operational altitude. The dispenser must hold the quartet of satellites securely in place during the stresses of liftoff and then the nearly four-hour long flight to medium-Earth orbit. Once the Ariane 5 EPS upper stage reaches its target altitude, the dispenser must then release the four Galileo satellites smoothly using a pyrotechnic release system triggered by separate igniters, each one firing half a second after the other. 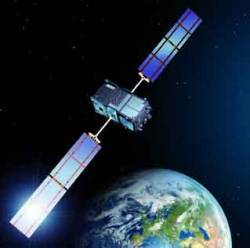 The separated satellites are then pushed away from the dispenser in separate directions using a spring-based distancing system.